Last month the New York Times ran an article called How Exercise Changes Our DNA. That’s right, folks, DNA. We usually think of exercise in terms of bellies and biceps, lungs and love handles, but the effects of exercise go much deeper than that; literally to the core of who we are. A recent study showed significant changes to the genes in exercised muscles. The study participants exercised one leg, but not the other, on a bicycle. After three months, the exercised leg’s DNA had changed and the lazy leg’s hadn’t. I’d like to make 3 points based on this research. The participants exercised their loner leg for a total of 3 hours per week, not per day, and that exercise made a difference for Loner Leg. Three hours per week is an attainable goal for all of us, even those of us who identify more with Lazy Leg than Loner Leg. Exercise helps your body be healthy from your genes to your jean size. If you are exercising, but lament the lack of visible changes in the mirror, don’t give up: healthy, positive changes are happening, you just need a microscope to see them. Genetic predisposition can’t hold you back. The genetic wiring you’re born with does not control who you become: you do. You might be genetically predisposed to heart disease, obesity, or diabetes, but the actions you take can change your genes. It’s like training a dog: certain breeds have known tendencies toward stubbornness, sweetness, or aggression, but all breeds can be trained. We’re a couple of weeks into the New Year, when most people slacken their resolve to get healthy. (No statistics to back me up here, just personal experience.) Don’t give up; don’t leave your dog half-trained. 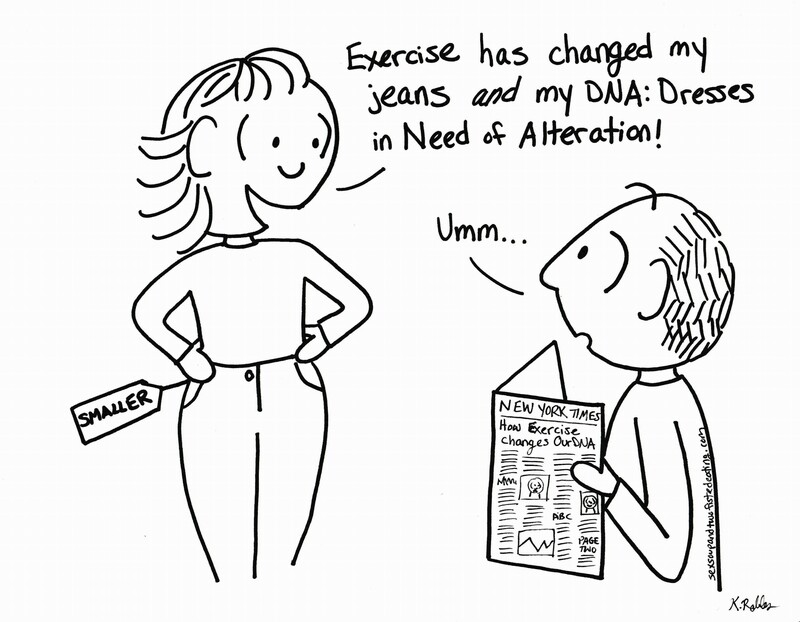 Your genes and your jeans will thank you!